A zone of low risk and high return. High value-added projects with low risk belong to this zone. Preferable projects for enterprises belong to this zone, where investment has a top priority. A zone that includes many low-risk and low-return projects that serve as "means of subsistence." This zone includes projects with lower added-values and less technical risk, where functions and purposes for use are enhanced through the use of past technologies and products. A zone of high risk and high return. Projects that have high added-values but high technical risk as well, and need breakthrough belong to this zone. However, such projects will be transferred to the pearl zone if they succeed in technical breakthrough. A zone of high risk and low return. Burdensome projects belong to this zone. However, if enterprises aim to develop new technologies and convert them to other projects as a strategy, they may intentionally generate projects of this zone. Balanced Score Card is designed to link corporate strategies with organization activities by specifying value drivers derived from corporate strategies and developing them into activities of organizations and individuals as a performance evaluation index. 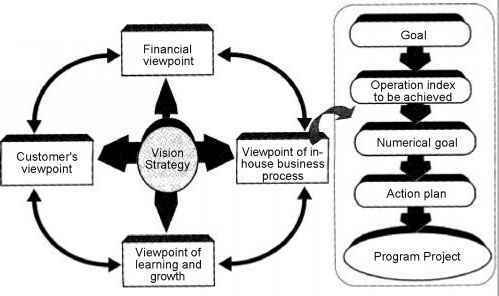 In Balanced Score Card, the following four viewpoints are mainly proposed for achievement of strategies. Goals are established in each viewpoint, and programs and projects for achieving strategies are clarified through step-by-step development, e.g., operation indexes for achieving goals, numerical goals for operation indexes, and action plans for achieving such goals. Enterprises have their strategies but also have difficulty in their actual application to business. Therefore, many companies often have such projects that are not aligned with their strategies, which result in deterioration of their competitive power. Given that project activities are the basis for actual activities of enterprises, it is critical for enhancement of corporate competitive power to keep projects consistent with corporate strategies and to implement projects so as to contribute to strategy achievement.